At ProTel we recognize the importance of ‘why dirt is the enemy’ in fibre optic networks. What exactly does the contamination do? The most common problem is “Insertion Loss” when contamination blocks the optical signal from passing from one connector through the end-face into the next connector. If the light doesn’t get past the dirt, the signal is completely lost. An equally problematic condition is called “Back Reflection.” This occurs when the two connectors are separated by a slight gap, perhaps caused by a particle of dust. When this happens, the end-face reflects some portion of the signal back towards the originating laser. Both of these problems can be prevented with proper cleaning. A more expensive problem occurs when the contamination on a connector is in the path of a high-power laser. Powerful lasers can actually fuse the contamination into the end-face, essentially destroying the connector, which will need to be replaced. Additionally, contamination during splicing will result in a physically weak splice, which will need to be removed and re-spliced. These inferior splices may also have a higher signal loss, so even if the physical strength is not a problem the performance of the network may be degraded. 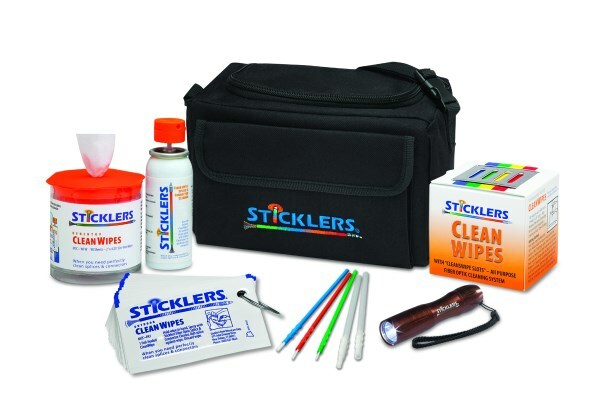 We Stock and recommend the world renowned Stickers® products for your fibre optic cleaning reqirements.